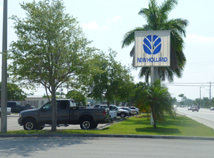 Founded in 1958, South Florida New Holland Corp., doing business as FORTRAC, is located in Homestead, Florida. We serve Miami-Dade, Monroe, and Broward counties as an authorized dealer for New Holland, Alamo, Honda and other manufacturers. We offer multiple lines of agricultural, commercial, and consumer products such as tractors, utility tractors, attachments, lawn mowers, chainsaws, weed trimmers, and much more. We supply our customers with only brand new, original parts for all of our brands. Our parts and service departments will take care of all of your needs, giving you the best possible customer service. Our goal is to provide excellent customer service and maintain our clientele for future projects. Because we are the only South Florida Distributor our prices are economically friendly. Contact us at (305) 247-1321 or email us at sales@fortrac.com. It will be a pleasure helping you find the right equipment for your specific needs. Copyright © Fortrac, 2011. All rights reserved.